Introduction EMSL Analytical provides testing services, sampling supplies and test kits to identify hazards in homes, schools and businesses following hurricane damage. Only two weeks after Hurricane Harvey decimated large parts of Texas, Hurricane Irma is causing grief and destruction in much of Florida. Countless residential, commercial and institutional properties have already suffered minor to major damage due to storm surges, flooding, heavy rains and powerful hurricane winds. While Florida is home to over 20 million people, a large number of residents left for higher ground to try and avoid the worst of the hurricane. As these people begin to return home when evacuation orders are lifted, many will likely encounter varying degrees of property damage to their homes, schools, churches, institutions and businesses. “Residents are being warned of potential indoor environmental exposure concerns and serious health and safety issues that they may now encounter in storm damaged properties,” said Joe Frasca, Senior Vice President of Marketing at EMSL Analytical, Inc. “Some of the most common indoor environmental quality problems faced by people following hurricane damage are associated with flooding and water damage. Floods and storm surges often introduce pathogenic bacteria and chemicals into a building. Simple water damage from a leaking rook or siding can support the widespread growth of mold in less than 48 hours if building materials stay wet. Even the process of cleaning up, repairing and rebuilding a damaged property could expose families, workers or other building occupants to such hazardous materials as lead-based paints and asbestos-containing materials, if they are not first identified so the proper safety protocols can be put in place. To help identify microbial and chemical contaminants, lead, asbestos and other hazardous materials and potential exposure concerns, EMSL Analytical, Inc. offers testing services, all of the sampling supplies necessary, easy-to-use test kits, and even a wide range of respirators and other personal protective equipment. 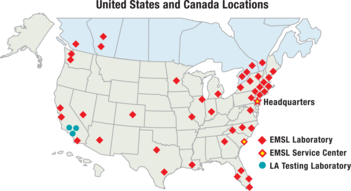 EMSL has multiple laboratories in Florida and many more across the United States and Canada to help Floridians quickly assess the damage and many of the health and safety concerns associated with this type of natural disaster. To learn more about indoor environmental quality testing of damaged properties or other indoor air quality, environmental, health and safety services, please visit www.EMSL.com, call (800) 220-3675 or email info@EMSL.com. For access to indoor environmental quality test kits, visit www.EMSLTestKits.com.